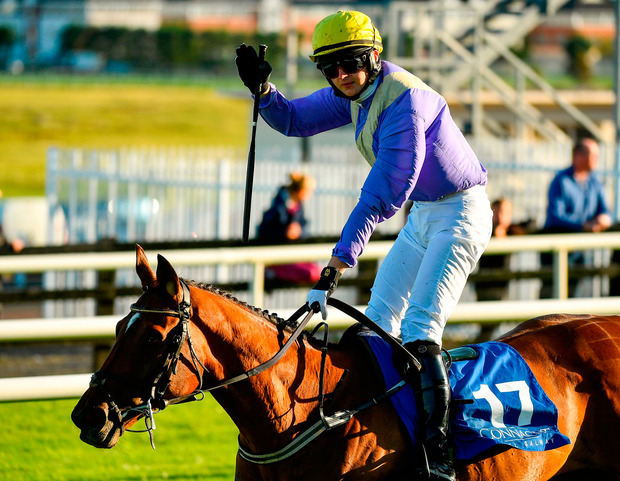 Jockey Aubrey McMahon celebrates as he crosses the line after winning the Connacht Hotel (Q.R.) Handicap on Uradel during the Galway Races Summer Festival 2018. The Galway Festival is winding down after a hectic period, but Willie Mullins is one man keen to keep the throttle down over the closing two days. His third successive champion trainer award at Ballybrit already looks to be in the bag after a scintillating week and he isn't slowing down with eight runners primed for the Galway Shopping Centre Handicap Hurdle (4.45). The Closutton maestro has taken the €100,000 feature - the headline act of an eight-race mixed card at Ballybrit - in three of the last five years and Uradel bids to double up after his impressive win in Monday's 'Amateur Derby'. As has been evidence over the past five days, selecting a Mullins horse is one thing, but choosing the right Mullins horse is an entirely different story altogether and today's showpiece is another puzzler. Ruby Walsh opts for the unbeaten Shanning, which did nothing wrong on either of his hurdle starts and comfortably took a novice hurdle at the course last October. Race fitness may be an issue, however, while Bargy Lady (David Mullins) thrived when stepping up to a similar trip at Killarney two weeks ago and top-weight Meri Devie (Niall Kelly) should be competitive having taken a valuable handicap hurdle at the Punchestown Festival when last seen over obstacles in April. English trainer Harry Fry was out of luck with Drumcliff in Thursday's Galway Hurdle and bids to bounce back with Minella Awards but the recent Festival form of Uradel tips the balance in the seven-year-old's favour and Paul Townend can score once again on a Closutton second string. The Adrian McGuinness pair of Beau Satchel and Guanabara Bay both made the frame earlier this week, but one with winning form around Ballybrit is preferred in the Ardilaun Hotel Handicap (3.35). Meath trainer Sheila Lavery always does well at Galway and the fact that TRUFFLES had subsequent winner Honor Oak well behind her when scoring on Tuesday makes her an obvious selection with Gavin Ryan's 7lb claim offsetting her 6lb rise for that win. 'Shark' Hanlon's Camlann just held on at the finish when prevailing here on Thursday and may be susceptible to an improving sort with Aidan O'Brien's ERIN fitting the bill in the McDonogh Capital Investments Handicap (4.10). The daughter of Mastercraftsman looks to have gotten the hang of things at this level and can follow up last week's impressive win at Gowran Park in the hands of the trainer's son Donnacha. Sean O'Grady It was a week of fun and festivities for punters around the country as they enjoyed this year's Galway Races. Limini had to make do with minor honours for the second time at this year's Galway Festival as stable companion Nessun Dorma claimed victory in Friday's Guinness Handicap.